Hunted to extinction for their horns, these two-horned Rhinos had very poor eyesight and have been known to use birds (oxpeckers) as an early warning system of approaching threats! The rarest of the black rhino subspecies, the Western Black Rhino was officially declared extinct in 2011. Their extinction was caused mainly by poachers killing them for their horns, which are highly prized on the black market and used in traditional Chinese medicine. 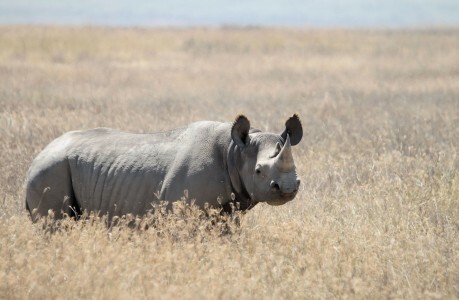 Western black rhinos had very poor eyesight, unable to clearly see anything more than 30 meters away. They did, however have excellent senses of smell and hearing. Sadly, this was not enough to protect them from poachers. Despite being big and bulky, Western Black Rhinos could move quickly and had been recorded at speeds as high as 55 km/h. They could change direction surprisingly quickly and run straight through scrub and bushes. There is actually no color difference between White and Black Rhinos. They are both of a dark grey color but this varies depending on local soil conditions.